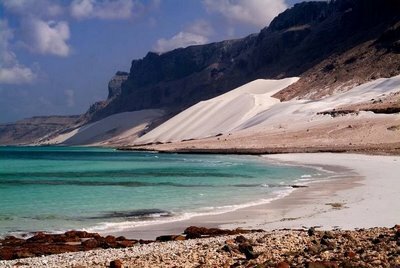 Socotra is a small Yemeni archipelago of four islands and islets in the Indian Ocean off the coast of the Horn of Africa, about 350 kilometers south of the Arabian peninsula. 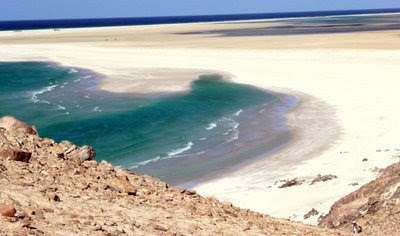 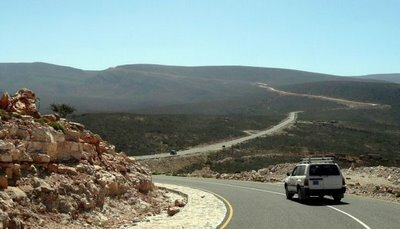 Socotra is one of the most isolated landforms on Earth of continental origin. 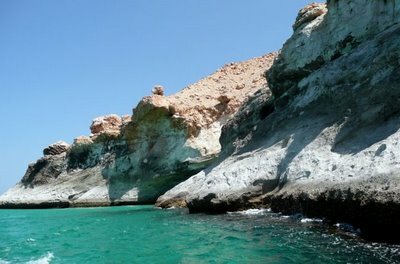 The archipelago features narrow coastal plains, a limestone plateau with caves, and mountains which rise to 1,525 meters above sea level. 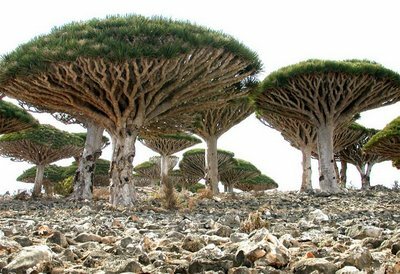 Like the Galapagos Islands, this island is teeming with 700 extremely rare species of flora and fauna, a full 1/3 of which are endemic, i.e. 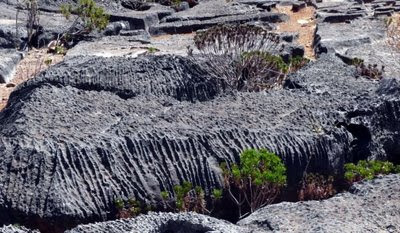 found nowhere else on Earth. 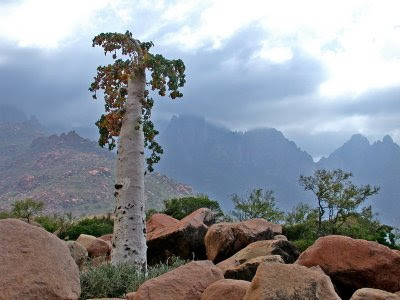 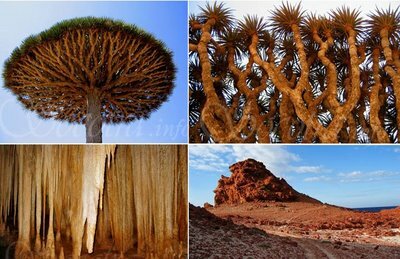 Socotra is home to more than 800 species of plants, some 240 of which are endemic to the island, and there are certainly many more plant species that have yet to be discovered. 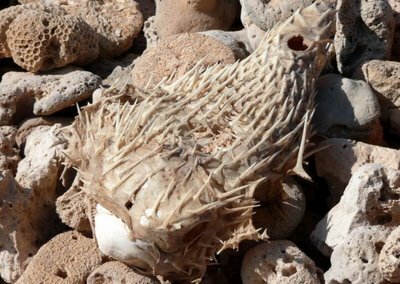 The climate is harsh, hot and dry, and yet – the most amazing plant life thrives there. 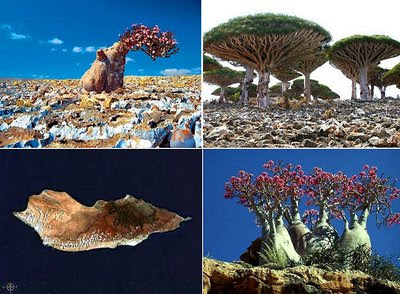 A Dragon’s Blood Tree (Dracaena cinnabari) is seen in front of the Skund mountains on the island of Socotra, Yemen. 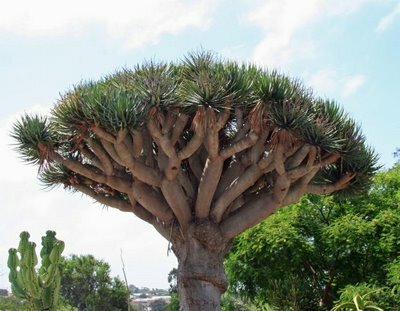 The tree is so named because any injury to the bark results in a deep red liquid excreting from the scar – compared in the past to the “Blood of Dragons”. 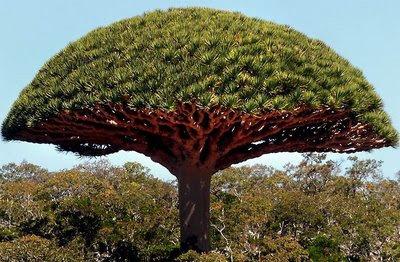 The branches spread out into the sky and from below appear to hover over the landscape like so many flying saucers… and from above they have a distinct mushroom look. 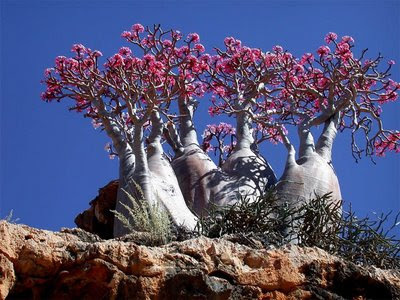 There is also the Desert Rose (adenium obesium) which looks like nothing so much as a blooming elephant leg. 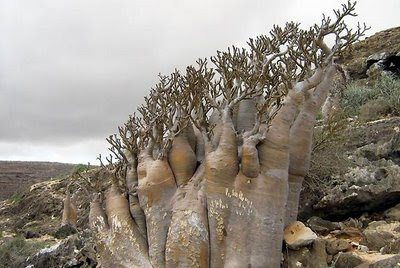 A Socotran Fig Tree (Dorstenia gigas) with a bizare swollen trunk that almost has human proportions grows against a limestone rock face on the island of Socotra. 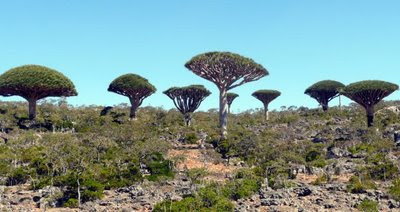 The plants are one of over 300 plant species endemic to the island.